With BlueHost, you get a lot of bang for your buck, but your wallet is going to be a little lighter than some other hosting options. While BlueHost’s $6.95 a month rate is affordable for most users, it ranks on the higher end of many web hosting companies who seem to dip below the $5.00 mark on average. Luckily, if you’re hesitant about signing up, BlueHost offers a 30 day full money back guarantee on any new hosting plans, so you can give their service a try and if you’re not satisfied, return it for a full refund. In terms of features, BlueHost offers everything you need to build, maintain, and host your personal or business website. Whether your site is built with Ruby on Rails or PHP, Perl or Python, BlueHost provides the web hosting tools you need to get up and running immediately. When it comes to your business, site performance is a major factor in finding a compatible web hosting provider. At BlueHost, all servers have redundant backup power by diesel generators, 24/7 network monitoring, off site backups in case of fires, and a 99.9% uptime guarantee. With BlueHost, your site will be humming along at top speed, and backed up to ensure your site can be recovered in the event of a crash or other major catastrophe. BlueHost is well known for their dedication to support. You can reach BlueHost administrators 24/7 via live chat, email, or telephone. In addition, the BlueHost support resources offers hundreds of pages of self-help articles that can help you quickly and easily solve most problems on your own. Friendly and exceptionally responsive, BlueHost admins often respond in minutes to any major issues no matter what time of day you run into problems. It would be nice to see a web community forum though, where other customers can help each other. For maintaining your web site, BlueHost uses the cPanel control system, which is the web hosting industry standard tool for creating and maintaining your website. cPanel is a fully featured platform that allows you to do everything from monitor statistics on traffic, setup a database, create and control email accounts, and even build a website in a single click. 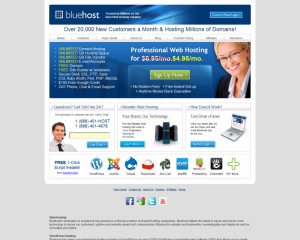 Overall, BlueHost is a time tested web hosting provider that has been hosting websites for more than a decade. The old adage is true, you get what you pay for, and BlueHost knows that their superior service and support justifies their slightly higher monthly costs. If you’re looking for a truly robust web hosting provider for your small or large business, you would be hard pressed to find a web host that gives you as much bang for your buck as BlueHost.